Cities and towns like public art. It adds culture, which in turn leads to a higher standard of living, which in turn leads to businesses wanting to set up operations in those cities because they want their employees to enjoy a higher standard of living. Public art is certainly not a bad thing, and can lead to many positive outcomes. But cities should be aware that when they commission public art it imposes certain responsibilities on the city and gives certain legal rights to the artists. Most important of these rights are the artist’s First Amendment rights and rights under the Visual Artist’s Rights Act (VARA). If cities are not careful, they can run afoul of these rights. Take, for example, Philadelphia. In 2000, Philadelphia commissioned a mural called “Father’s Day”. It features Martin Luther King, Jr., Nelson Mandela…and Bill Cosby. The mural was painted over a few weeks ago. 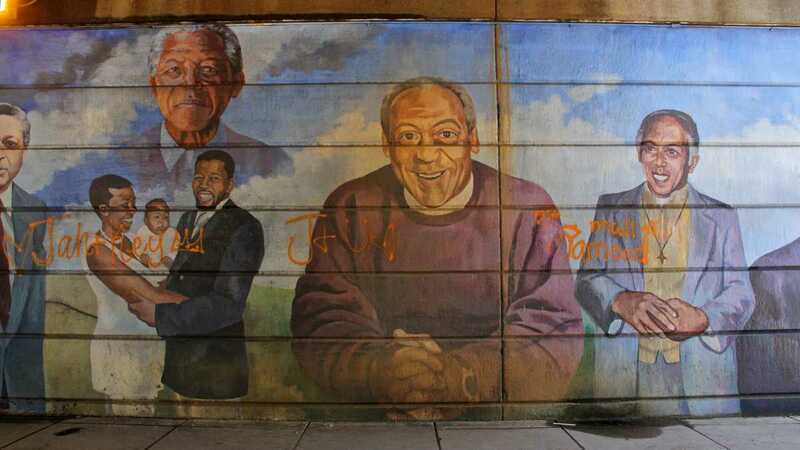 This gives the appearance that it was painted over as a result of the accusations against Cosby and subsequent public scrutiny. In other words, the subject of the mural was no longer popular in the city’s mind. The mural was apparently under the purview of the Philadelphia City Mural Arts Program. It is a non-profit that describes itself as a public/private partnership. If it is in fact a government organization/entity, it may have violated the artist’s First Amendment by suppressing the artist’s artistic expression. The government or a governmental entity does not have the right to decide which speech is better than others. 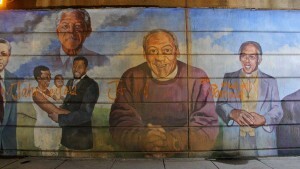 By painting over the mural, the city was clearly condoning Cosby’s alleged actions, and therefore engaging in speech of its own. It prioritized its speech over that of the artist–something the city is not allowed to do under the First Amendment. We do not know whether the artist might have stood by the message the mural was trying to send–the importance of father figures and strong black men…perhaps in a community that needed such figures. Even if there is no First Amendment claim, the artist certainly has a claim under the Visual Artist’s Rights Act (VARA). VARA protects the right of artists to the integrity of their work. VARA protects all visual works of art created after June 1, 1990. This means that a city may not destroy/move/change a work of public art on it’s own volition. By painting over the mural, the city has destroyed the integrity of the work, opening it up to a claim that it violated VARA. Of course these are claims that only the artist can make. And it is possible that the artist will not make either claim. But for cities interested in commissioning public art, they would do well to consider the long term future of that work when commissioning it, and not act on impulse when removing it, particularly when the art is no longer considered popular by the city. Such actions could result in serious legal trouble.